When the dust settles on the 2018 NPL2 season it will be marked a huge success for the North Geelong Warriors. Many had tipped the region’s only NPL club to struggle after a dismal 2017 and a large overhaul of first-team players. However, the club set about an ambitious plan which was centred on youth development and lifting its coaching ranks, signing the experienced Luciano Trani as head coach had the mark of a terrific building year. The season got off a great start with four wins on the trot including the scalp of eventual Champion Altona Magic. Soon after, though, the results and the performances began to teeter, and on the eve of the half way mark Trani unexpectedly quit. The club is no stranger to a call to arms, and in a sign of resolve the players and interim head coach Nathan Rogers put in a run of wins to signal their season was alive. This was soon followed by the signing of James Coutts as the new head coach. Coutts came in and adjusted the playing style and personnel slightly to continue the run of victories, collecting 30 points on the back half of the season and elevating the Warriors to third spot. In the team’s final round against Ballarat last week, the Warriors knew that that only a win for them and a loss to St Albans would offer any chance of promotion. 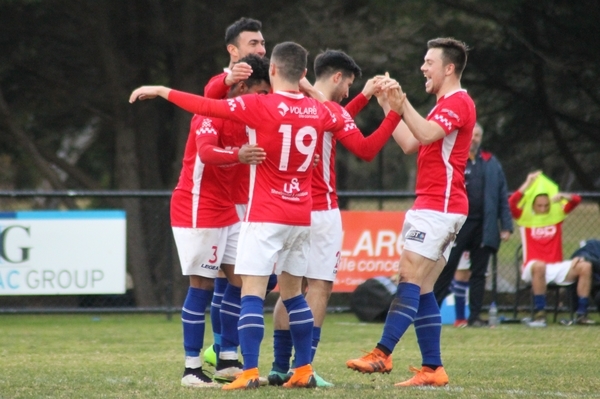 The Warriors did their part with a 3-1 win on the back of goals to Jamie Noggler, Darius Madison and Stefan Papageorgiou but the desired result from St Albans didn’t eventuate, and so too slipped the chance for a playoff to re-enter NPL1. Despite the disappointment felt by the players by coming so close, the overall feeling was pride, in particular for the vocal and ever present supporters of North Geelong. The signs are there for strong 2019 with almost all of the squad already committing to the take up the challenge again with the Warriors. In under-20s, the youthful Warriors finished their season in fourth with a 3-1 win after goals to Jesse Krasic, Daniel Gudasic and George Ellis.